I joined the Royal Air Force at 16 straight from Thornbury Grammar School. I wanted to fly from about the age of 11, and I knew of a number of school students had joined the Air Force as Aircraft Apprentices. This involved a three year course covering all aspects of aircraft and engine technology, at the end of which a pilots course was available for those who qualified academically and physically. My course had ended in March 1940, and I was granted a pilots course immediately, obtaining my wings in December 1940. The Battle of Britain was over, but Bomber Command was rapidly building, and so most of us were drafted to bombers. I was posted to the Gold Coast (Ghana now) to ferry twin engine bombers from the assembly unit in Takoradi, Gold Coast, through Central Africa to Cairo in Egypt, where the aircraft were prepared for operations in the Western Desert. Did this for 18 months, returning to England in June 1942.1 converted to fly four engine bombers, Handley Page Halifax, and started operational flying on these aircraft in January 1943. My crew and I completed an extended tour of operations after which we were "foolish enough" to volunteer for another tour on Pathfinders. We were asked to join a special duty type of Squadron which we accepted. The operations would involve attacks on special targets needing precision bombing techniques, such as dams, bridges, isolated ships etc. some of which would be daylight attacks. We accepted this direction, which meant converting to four engines Lancaster aircraft. All, except one member who had already completed a tour of bombing operations, joined my crew. He was the rear gunner, and was replaced by a Canadian. This resulted in my crew consisting of an Australian navigator, a Canadian bomb aimer, a Canadian rear gunner, with the rest of us English. Quite a delightful mixture. The aircraft crew contained only one pilot with the bomb aimer and flight engineer taught to fly straight and level, in the event of pilot injury, but they would not attempt to land the aircraft, turning it out to sea with the crew parachuting out, once the English coast had been reached. Our crew never needed to exercise this manoeuvre. 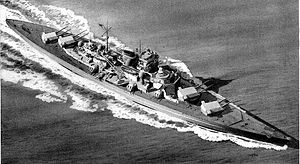 We completed our two extended tours on November 12th 1944 by attacking the German Battleship "Tirpitz" (pictured below) in Tromso fjord Norway. Twenty nine Lancaster bombers successfully completed the attack, each carrying one 1200 pound bomb, called "Tallboy", named for the designer Barnes Wallis, who was a tall man. The Battleship was destroyed much to the delight of Sir Winston Churchill, who wanted that "beast" sunk at all costs. I was awarded the Distinguished Flying Cross for my actions, and finished with the rank of Flight Lieutenant, leaving the Royal Air Force in August 1946. Some years after the war, Jeffrey emigrated to the U.S. where he had to take out citizenship in order to take advantage of the opportunity to work on top-secret jet engine development, in the company of Frank Whittle and the leader of the German war-time jet engine project. Jeffrey's C.V. has included a B.Sc. and an M.Sc. taken during his mature years, is littered with contacts with distinguished aero engineers and projects. An incredible fact about Jeffrey's career in Bomber Command is that during a colossal 83 flights he was never shot out of the air and neither did his crew suffer any casualties.